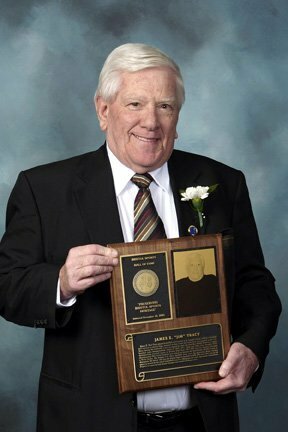 James E. ‘‘Jim’’ Tracy played basketball and baseball at St. Joseph’s School, football, basketball and baseball at Bristol High, baseball at Holy Cross and basketball and baseball in the U.S. Navy. Among the successful teams he played for were the first four Bristol American Legion baseball state championships teams of 1950, 1951, 1952 and 1953, four straight CCIL championship baseball teams at Bristol High from 1951-1954 and the Eastern Division championship Holy Cross baseball team where he became the first Bristol athlete to play in a World Series. His Subpac U.S. Navy baseball team were the Hawaiian Major League champions. He batted .400 plus for Bristol High in baseball in both 1953 and 1954 and the 48 points he scored for the school basketball team in a 1954 game set a new city record. A benefactor of sports, he supported both Special Olympics and women’s bowling in town.